A January 2013 meeting of experts convened by the GCI and the Getty Museum to discuss the conservation of Jackson Pollock's Mural, (1943). Painting: University of Iowa Museum of Art, Gift of Peggy Guggenheim, 1959.6. Reproduced with permission from the University of Iowa. Photo: Stacey Rain Strickler, J. Paul Getty Museum. The GCI's Modern and Contemporary Art research Initiative1 (ModCon) has been a major component in the Institute's overall research portfolio since its official launch in 2007. By then, our interest and involvement in the conservation issues of modern and contemporary art had been growing for years, as had that of many other institutions and colleagues. One of the Institute's first activities in this area was the 1998 conference “Mortality Immortality? The Legacy of 20th-Century Art.” This Getty event sought to foster a cross-disciplinary discussion among artists, art historians, collectors, conservators, and curators—collaboration that has now become the norm. Later, in 2002, as many research groups had begun to scientifically explore modern materials used in contemporary art, the GCI started a long-term study of conservation issues of modern paints, initially in collaboration with Tate, London, and the National Gallery of Art, Washington, DC. Although a relatively recent addition to the GCI portfolio, ModCon is now in full swing, and it is not too soon to reflect on some of the advances made in the field since then and on how needs are evolving. ModCon was launched in response to a growing realization within the conservation profession that research in this area was a priority. Many key issues had already been identified, including broad philosophical and ethical matters and specific materials questions. Ethical dilemmas concerning the conservation and care of contemporary art have led to uncertainty in the art world. For example, an artist's wish to refabricate a deteriorated work to recapture the object's original appearance—frequently, if problematically, referred to as “the artist's intention”—challenges conservation ethics on reversibility and conservation of original materials. Similarly, replacing obsolete technological elements of a technology-based work raises questions of how closely such a work now reflects the original, both materially and intellectually, and what role conservation plays in making that determination. The vast increase in the variety of materials used by artists to create works is a significant practical problem, since each of these materials has its own, often unique, set of aging properties, as well as display or storage requirements. Materials that are inherently unstable quickly show signs of deterioration and are, of course, of great concern to conservators. (One commonly cited example is early cellulosic plastics used in twentieth-century sculpture and design items; these are capable of sudden and drastic degradation that can quickly result in objects becoming impossible to display.) The seemingly limitless range of materials can leave the conservator of contemporary art hard-pressed in many cases to find well-tested conservation materials for a treatment, and conservators often have to undertake remedial treatments that have not been fully evaluated. This problem is intensified when there is, on the part of the owner or artist, a low tolerance for any sign of aging; intervention may then be required comparatively early in the life of the object. From the outset, the GCI adopted a broad approach to its involvement in this area, developing a range of focused scientific research projects with a number of partners and establishing a comprehensive strategy for information dissemination and sharing— vital for making the research and thought accessible to the field. Much GCI scientific research to date has focused on the study of synthetic polymers, whether used as plastics, resins, or paints. Early work developed analytical methods for the identification of these new materials before moving into monitoring and assessing polymer stability and evaluating the effectiveness and potential dangers of conservation treatments. One large project with GCI participation, Preservation of Plastic Artefacts in Museum Collections (POPART), ran from 2008 to 2012. This collaboration—coordinated by the Centre de Recherche sur la Conservation des Collections, Paris—included a consortium of mostly European research laboratories, making possible far more rapid developments into appropriate analytical methods for plastics than could have been achieved individually. As a result, clear analytical protocols were established that are now being used by the field. Additionally, collection surveys were compared, extensive degradation studies carried out on a selection of plastics, and a range of conservation treatments explored. The GCI Modern Paints project has been running even longer. Following the “Modern Paints Uncovered” symposium held at Tate Modern in 2006, its work has focused extensively on assessing the effects of cleaning acrylic emulsion paints. In partnership with Tate and the Dow Chemical Company, the project has developed and evaluated a range of novel cleaning systems that are now generating a series of workshops, as discussed below. A more recent project on outdoor sculpture initially studied paint systems for harsh outdoor environments. Although some analysis of different types of paint has been done, more attention has been paid to developing protocols for artist studios, estates, and foundations for agreement on reference paint coupons with approved surfaces, color, and gloss. Even when a great deal of scientific research is done in conservation areas, the knowledge gained from that research is not always readily transferred to practicing conservators. There is also a temptation for researchers to pursue interesting lines of research that may deviate from the initial questions posed by conservators. Workshops offer an excellent opportunity to take stock of recent research and examine its interpretation and implementation by conservators. One area where the GCI has devoted significant attention in developing workshops is the cleaning of acrylic paintings. To date, five workshops have been held under the Cleaning of Acrylic Painted Surfaces (CAPS) banner. These workshops have brought together groups of conservation professionals to test the new methods developed from earlier GCI work on acrylic paint media, providing feedback from field practice and highlighting areas requiring further research. An early CAPS workshop—held at the Museum of Modern Art, New York, and involving local conservators from both institutional and private practice—sought to build on the local conservation community and to facilitate the sharing of information and experiences within the group after the workshop. Subsequent workshops have been held in London, Sydney, Ottawa, and Washington, DC. 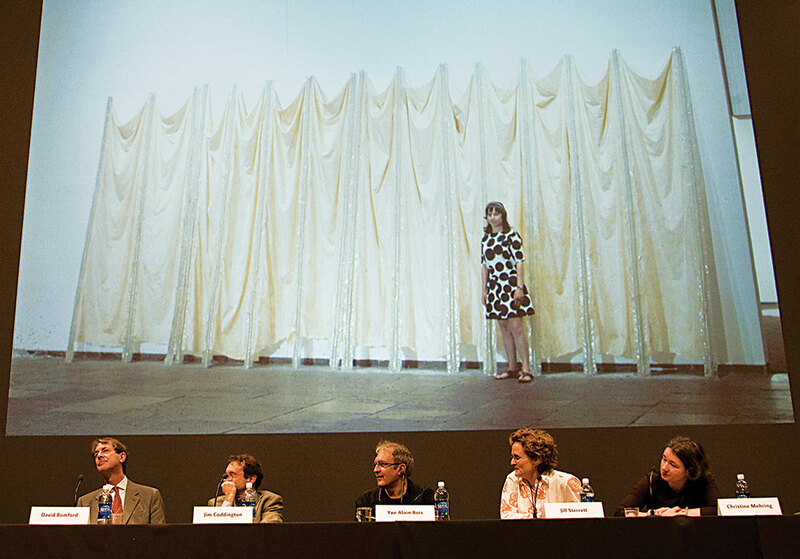 A panel at the “Object in Transition” conference, held at the Getty Center in 2008. Photo: Getty Research Institute. Background photo: Artist Eva Hesse with Expanded Expansion at the 1969 exhibition “Anti-Illusion: Procedures/Materials” at the Whitney Museum of American Art, New York. © The Estate of Eva Hesse (photographer unknown). Although a major undertaking, conferences and symposia remain an essential component of any strategy for improving information sharing and dissemination. In 2008 the GCI and the Getty Research Institute (GRI) organized “The Object in Transition: A Cross Disciplinary Conference on the Preservation and Study of Modern and Contemporary Art.” This Getty Center conference focused on the conservation of contemporary sculpture, painting, and mixed-media artworks and fostered greater dialogue among conservators, artists, art historians, and curators about conservation issues impacting contemporary artworks, primarily via intensive reflections on specific case studies and in general panel discussions. Artists discussed included Eva Hesse, Sol LeWitt, Roy Lichtenstein, Piet Mondrian, Bruce Nauman, Barnett Newman, David Novros, and James Turrell. A number of relevant artworks—some no longer displayed at their institutions because of their deterioration—were exhibited in a special gallery at the Getty Museum, enabling conference participants to contribute more fully in the discussion of them. The entire conference was videotaped and is viewable online at getty.edu. It has achieved some impressive viewing numbers; for example, the session on Piet Mondrian's Victory Boogie-Woogie has been viewed over six thousand times. Exhibitions are becoming an important tool in overall dissemination strategies, providing a means of raising awareness of current conservation issues within a wider community than our core professional audience. To date the GCI has been involved with two exhibitions, Jackson Pollock's “Mural” in 2014, and From Start to Finish: De Wain Valentine's “Gray Column,” the GCI contribution to the Pacific Standard Time exhibitions of 2011–12. Jackson Pollock's seminal work Mural (1943), owned by the University of Iowa Museum of Art, was the focus of a major conservation and research project by the GCI, the Getty Museum, and the GRI, culminating in the exhibition. The newly conserved painting was displayed in one gallery, and the research undertaken and conservation decisions made by the GCI and the Museum were presented in a second. The exhibition covered the two main aspects of the GCI's role in the project: the salient features of an in-depth technical study of the painting and a description of some of the choices made during the conservation treatment. The earlier exhibition, From Start to Finish, was dedicated to the materials and fabrication processes used by artist De Wain Valentine. Valentine was unique among his contemporaries in that he developed, in collaboration with a polymer chemist, a new type of polyester resin that allowed him to create very large polyester sculptures. The exhibition described how Gray Column, an extraordinary artwork never before displayed in public, was made—from the casting of the resin to the extensive polishing required to achieve the final, perfectly smooth finish. The exhibition also explored practical and ethical issues in the conservation of this work. For example, how pristine should the piece look almost forty years after its creation? And should its surface be made even smoother, now that sandpaper is available in much finer grades than it was in the 1970s? The GCI also initiated a drive to expand the publication of other research in the field of modern and contemporary art conservation. A number of books are already available, and many more are planned. One of the main areas of current activity is a series called The Artist's Materials. These books look in depth at the materials and techniques of a number of influential twentieth-century artists and examine their implications for the conservation of the artists' work. Three are already published—one on Willem de Kooning (by Susan F. Lake), another on Jean Paul Riopelle (by Marie-Claude Corbeil, Kate Helwig, and Jennifer Poulin), and a third on Lucio Fontana (by Pia Gottschaller). Five more are in production. 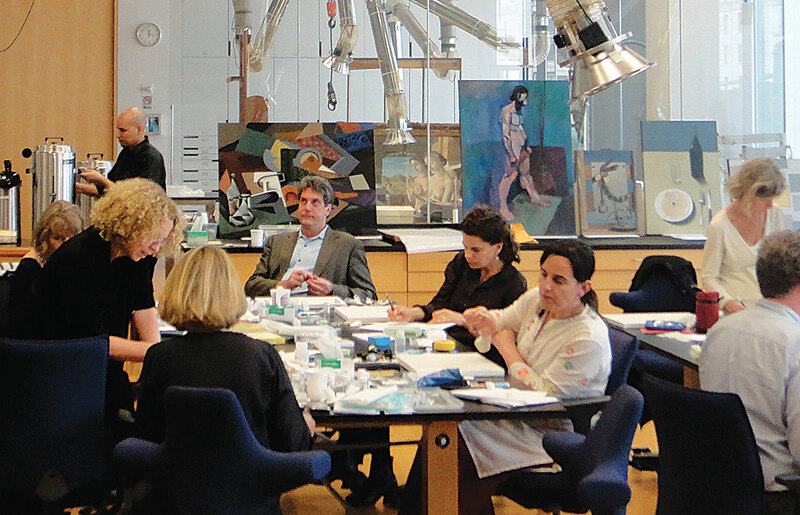 A GCI-organized workshop on the cleaning of acrylic painted surfaces, held in 2011 at the Museum of Modern Art in New York. Photo: Tram Vo, GCI. It has been eight years since the GCI embarked on its long-term research initiative to study the conservation of modern and contemporary art, and its broad portfolio of projects and events is likely to last for at least eight more. The challenges and priorities remain ever present, after all. But how has the field changed in those years, and how should this initiative respond to those changes and others in the field? Even in this relatively short period, there appears to have been a shift away from what might be described as controlled panic, when the conversation was dominated by the enormous problems facing the profession and the paucity of obvious solutions. Something of a reality check has seeped into the thinking of many conservators: a lot of modern and contemporary art simply cannot last, and we should therefore perhaps stop obsessing about it. There will always be limits to what we can really do, given all the constraints. Conversely, there has also been a somewhat reluctant shift toward the notion that documenting works of art is not a sufficient strategy in itself. There are clear advantages to the high level of documentation now occurring on many types of contemporary art, and there are undoubtedly valuable technologies just around the corner that will even record experiences and sensations. But there are also times when, beyond documentation, conservation decisions must be made and treatments undertaken. How then does one design a research strategy acknowledging these facts of life in contemporary art conservation? On the one hand, by accepting the inevitable, we admit that we have to choose our agenda wisely, in ways that address truly significant, though difficult, problems. In a more positive vein, difficulty is in fact a strength, since complexity and uncertainty are actually embraced. This embrace is, after all, not unlike the stance of the very artists whose work we seek to understand and preserve. Tom Learner is head of GCI Science. Jim Coddington is the Agnes Gund Chief Conservator at the Museum of Modern Art, New York.